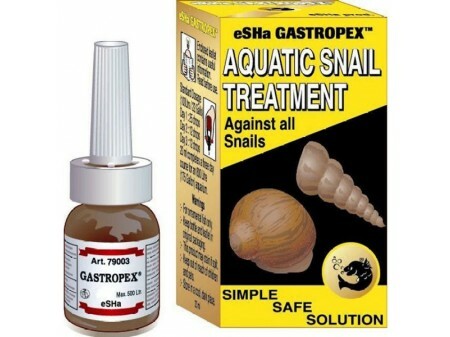 eSHa Gastropex effectively combats aquatic snails in your aquarium. Use Gastropex to stop snails destroying aquatic plants and transmitting disease to your fish. Can be used as a preventative bath for new plants; this prevents snail colonisation and the runaway growth of micro-organisms. - Destroys all aquatic snails. - Safe to use with fish and plants. - Clears cloudy water (bacterial Blooms) and combats Hydra. - Usually no extra water change required after use. - Suitable for tropical feshwater and coldwater aquaria. 10ml treats a maximum of 500 litres (110 gallons) of aquarium water.